WASHINGTON (Oct. 06, 2009) -- Army leaders will work to provide the forces necessary to be successful in Afghanistan, while at the same time attempting to balance that demand with the needs of Soldiers and families, said the service's senior-most officer. "Looking us in the face are decisions yet to be made about Afghanistan," said Chief of Staff of the Army Gen. George W. Casey Jr. "It will impact on us, but I can also tell you that I will do in the next few weeks what you would expect of any of our Army leaders: I will balance mission and men. And I will work with the other service chiefs to provide the forces necessary for success in the current conflict, while balancing that with the needs of our Soldiers and families." Army leaders will work to provide the forces necessary to be successful in Afghanistan, while at the same time attempting to balance that demand with the needs of Soldiers and families, said Chief of Staff of the Army Gen. George W. Casey Jr. during the "Eisenhower Luncheon" at the Association of the United States Army 2009 Annual Meeting and Exposition in Washington, D.C.
Casey spoke during the "Eisenhower Luncheon" at the Association of the United States Army 2009 Annual Meeting and Exposition. The chief spoke to an audience of several thousand Soldiers, civilians, and foreign military members. He used the opportunity to provide an update on the status of the Army, discussing the Army's successes and efforts to put itself back in balance -- including the importance of increasing dwell time for Soldiers. "The most important element of getting ourselves back in balance is to improve dwell," the general said. Adding to an improvement in dwell time are recent draw downs in Iraq, though unknowns about the Army's future in Afghanistan may affect dwell time in unexpected ways, the chief said. Casey said he wants to move the active force to a rotational cycle of almost one year deployed and two years at home station, and to move the reserve component to a 1:4 ratio by 2011. "I am pleased with the progress we have made as an Army, and I believe we will continue to move along those lines and we will get very close to our objectives here by 2011," Casey said. The chief also highlighted additional progress the Army has made putting itself back into balance. He began with Army efforts to sustain Soldiers and their families -- including the recently renewed "Army Family Covenant," now starting its third year. 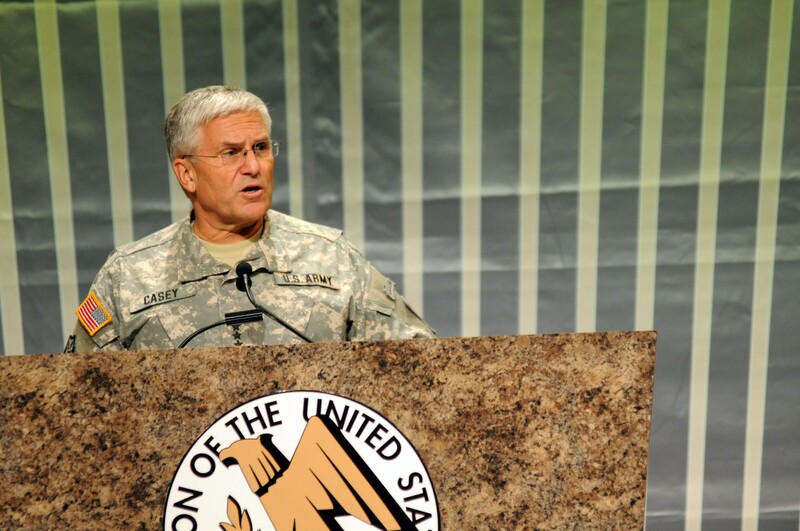 The general said he met with Army family members to discuss how the service is doing on execution of the Army Family Covenant -- he said he got "mixed reviews" in some areas, but generally "families see a positive trend in what we are doing for them," the general said. "We are absolutely committed to delivering on the family covenant." The general also talked about the Army's growth in end strength. In 2007, he said, the Army was told to increase end strength of the active force by about 65,000, and the Guard and Reserve forces to increase by about 9,000. The Army had until 2012 to complete that growth, but actually completed it by May 2009. "That will have a great effect on the long-term health of this force," he said. He also said that, even as the Army worked to complete that growth, Army leaders knew it would not be enough to sustain the Army at the current demand on forces. This July, he said, an additional, temporary adjustment to end strength was approved, allowing the Army to increase by some 22,000 Soldiers. "With Secretary Gate's support, he allowed us to grow the active force by another 22,000 Soldiers, on a temporary basis, so we could effectively man the units that we are sending in harm's way and come off of stop-loss," Casey said. He said the Army has already met those additional goals for this year, with a growth of about 5,000 Soldiers. "We are in very good shape on the growth and even though we have a few more units to build, I am very pleased with our progress in that area," Casey said. The Army is also rebalancing through conversion to a modular force, and rebalancing forces away from Cold War skills to skills more important in today's conflicts. In that area, the chief said, the Army has come a long way. "We are almost 90 percent done with converting" to modular brigades, he said. "That is a huge accomplishment. "We are about two-thirds of the way through rebalancing the force -- moving away from Cold War skills to skills more relevant in the 21st century. Taken together those represent the largest reorganization of the Army since WWII." Base realignment and closure, as a result of the 2005 BRAC, is also bringing the Army into balance, the chief said. He said some 380,000 Soldiers and civilians will be affected. "The positive side of this is the quality of our installations has already and will continue to increase substantially," he said. "You cannot go on an Army installation without seeing cranes. That is a great boon to our Soldiers and families." The Army's Force Generation Model is another key factor in putting the Army in balance, the chief said. The ARFORGEN determines how the service can present forces to combatant commanders -- and also affects dwell time for Soldiers. The model the chief presented allows for an active Army that deploys for one year and is back at home station for two. For the reserve component, that ratio is 1:4. Soldiers would be at any time in a "reset" phase, a "train-ready" phase, or an "available" phase. The model provides at any time a corps headquarters, five division headquarters, 20 brigade combat teams and 92,000 enablers. That force pool would be shared between active and reserve components, the chief said. The chief also said that Soldiers in the "train-ready" phase could be pulled for unexpected needs -- something the Army cannot currently do. "This is the Army we are building, and we are organizing our Army along these lines so that we can prepare versatile forces that are ready for full-spectrum operations in unexpected contingencies, at a tempo that is sustainable for an all-volunteer force," he said. "It will cause significant internal change in the Army to do this effectively, and we have been working on that for several years. Casey also spent time discussing Army modernization efforts, the efforts of the Training and Doctrine Command to restructure the Army's modernization strategy, efforts to incorporate Mine Resistant Ambush Protected vehicles know as MRAPs into the force, and efforts to bring a new infantry fighting vehicle into the force within a five to seven-year time period. "I know it's tough, but we will work with the Department of Defense and Congress to deliver the best capabilities to Soldiers," Casey said.